La Mirada, CA – Since 1915, Makita has been a leading power tool innovator. 2015 marks the 100th Anniversary of its founding, and Makita continues to lead the industry and meet the demands of the construction world with tools and accessories engineered to help make professional users more productive and meet high efficiency standards. 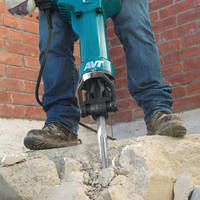 Makita recently released four new accessories for fastening, scraping, concrete breaking, and grinding. All are engineered for increased efficiency and results. Tile removal can be a time-consuming job and Makita has delivered the right accessory to get the job done more efficiently. The new 6" Floor Scraper is engineered for use with hammers that accept SDS-MAX shanks, and features a wide flexible blade for removal of tile, linoleum, and flooring adhesive with speed and efficiency. Features include an innovative tapered head design that helps to prevent shearing-off of the bolt heads, with bushings that help isolate vibration and reduce bolt loosening. The Floor Scraper is engineered for increased durability, with a high-strength steel design, protective coating to help prevent rust and corrosion, and grade 8 high-strength bolts for added durability. Replacement blades with fasteners are available (model T-02602, sold separately). The bull point chisel is the ideal accessory for general concrete breaking and chipping. However, effective breaking requires that the chisel remain sharp to penetrate hard concrete. The new Makita 16" Self-Sharpening Bull Point for 1-1/8" Hammers features an innovative design that is engineered to keep the bit point sharper longer than traditional bits. The bit features improved geometry for faster penetration and more efficient material removal. The Self-Sharpening Bull Point Bit is for use with 1-1/8" hex hammers, and is ideal for general purpose demolition in brick or concrete, as well as for starting holes in concrete. Makita is a leader in the grinder category, and Makita grinder accessories are demanded by top pros. Makita has released a line of INOX Grinding wheels that deliver improved material removal with less noise and vibration for improved efficiency and user experience. The Wheels feature aggressive composition for faster material removal, with a high-strength bonding agent for added durability and longer life. The 36-abrasive grit is engineered for efficient material removal (1/4" thick, 7/8" arbor hole) and the "N" grade hardness is ideal for working with ferrous metals including stainless steel. The INOX Grinding Wheels are available in 4-1/2" (A-95956), 5" (A-95962) and 6" (A-95978).